In our daily lives it’s hard to imagine there is anything that we use more than our eyes. For those of us who don’t have perfect vision, eyeglasses are a must-have item that we put on first thing in the morning and only take off when we climb back into bed at night. A couple years ago, my old glasses were in need of replacement. They were more than a few years old and had gone through a lot from regular (ab)use. Both the nose pads were long gone and one of the lenses had a tiny crack from dropping them on the bathroom tile floor that slowly spread until it was across half the width of the lens. It was definitely time for a new pair of eyeglasses. When I was younger and under my parents’ insurance, my father would take us to Sears Optical every other year for an eye exam and to pick out a new pair. Usually the insurance covered less than $100 of the cost of the frame, so I’d go through all the rows of frames on the shelves looking at each tiny price tag trying to find one within the insurance’s budget while hoping to still look cool wearing them. It’s no surprise that the cheaper frames weren’t all that stylish looking, so you could say I was fashionably ahead of everyone. I looked nerdy before being nerdy was cool. Fast forward a couple decades, I now work for myself and don’t have vision insurance. So I went to the local optometrist to explore my options for a new pair. I looked at some of the prices on the frames and it was easier to find ones that cost over $200 than under. And that is just for the frame without the cost of the prescription lenses and eye exam. Ouch. Now that eyeglasses have become a hot fashion accessory with frames from luxury brands like Prada, Ralph Lauren, Coach, and more, it’s really easy to spend hundreds of dollars on just a single pair of glasses. You’d think something made of plastic and metal can’t possibly cost this much. It also doesn’t help that a company named Luxottica designs, manufactures, and licenses many of the eyeglass brands, along with owning many of the retail stores. If you are thinking there has to be a more affordable way to buy new eye glasses, you are right. All you need to do is look on the internet. Prescriptions for glasses typically have an expiration date of two years. If you need a replacement pair of glasses because you’ve lost or broken your current pair and your prescription is still valid, you can call up your optometrist for your prescription if you can’t find it. 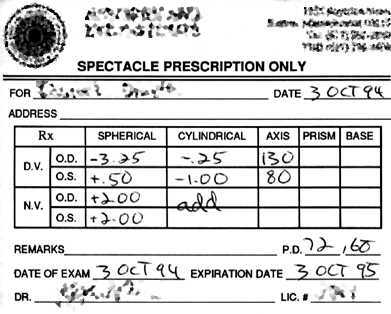 Usually after an eye exam, they will give you a little slip of paper that looks similar to the one below with your prescription written on it with a bunch of confusing numbers and terms. At my last eye exam, I did not even need to ask for a copy. If they do not give you this information, remind them of the Eyeglass Rule from the FTC, which requires eye doctors to provide patients with a copy of their prescription after an exam. They cannot charge an additional fee in addition to the exam fee or require you to purchase eyeglasses or contacts from them in exchange for the prescription. If you wear contacts lenses, keep in mind that an eyeglass prescription is slightly different from the contacts prescription. SPH or Spherical – The degree of your vision correction. The higher the number, the stronger your prescription. A negative (-) number means you are nearsighted, and positive (+) means you are farsighted. If you see SPH, PL, PLANO, or 00, this means zero correction and you should enter 0.00. Cylinder & Axis – This is for correction of astigmatism. If you do not have astigmatism, the cylinder field could be blank, or it might show SPH, DS, PLANO, or 00. ADD or NV – This is for bifocals or progressive lenses. This is the additional magnification for the reading portion of the lens. The pupillary distance (PD) is the distance in millimeters between the centers of the pupils of the eyes. If your prescription has your pupillary distance listed, then you are all set. Sometimes the eye doctor doesn’t include the PD with your prescription. My prescription didn’t have it listed. There have been stories of people being told by their optometrist that the PD is “their” number and refused to provide it, knowing that with the number you will be able to go buy your glasses online or from another store. Only a few states require doctors to disclose the number on the prescription. The good news is you are able to measure your PD yourself at home in a few minutes. All you need is a ruler in millimeters and a mirror or a friend. For more info on how to measure your papillary distance, you can check out this infographic created by Zenni Optical along with a link to print out a PD ruler if you don’t have one handy. Now for the fun part! Go online and start looking for eyeglass frames and designs that you like. For the best price, don’t worry about brand names. After all, glasses are all made from metal, plastic, and some screws and are pretty much all the same with a fancy logo glued or painted on them. If you really want a brand name pair of glasses, you still might be able to get them cheaper online than in the store due to lower overhead costs. For some, shopping online for something as personal as eyeglasses might seem difficult not being able to see or try them on first. Some websites will have models wearing the glasses to show you how they might look. Other sites, like Zenni Optical will let you upload a picture of yourself and they will superimpose the glasses on your face like how Snapchat filters put silly puppy ears and noses on your selfies. Another company, Warby Parker, will mail up to 5 pairs free to your home for you to try out. The benefit of shopping online is there are thousands of frames to choose from, many times more than what is available at the store, so you will definitely be able to find one that you like and fits your style. If you like how current pair of glasses look and fit, one thing I did when I was looking for my new pair was I measured the frame length and width and lens width and height of my old glasses to get an idea of an approximate size range to shop for. Since I knew what my old pair of eye glasses looked like on my face, I had a general idea of how the new pair will look. For most sites, the listed prices are for the basic lens with standard index. You will find that once you start adding on options to the lens, things like impact resistance, higher indexes, bifocals and progressives lenses, tints, anti-scratch and anti-reflection coatings, or UV blocking, the total price start going up quickly. To get the most savings on your new pair of glasses, you should decide what features you want and then compare prices from several online retailers. Once you’ve optioned out a similar pair of glasses at several sites, compare the final shipped price for the best deal. Buying your next pair of eyeglasses online can save you hundreds of dollars for the same quality of glasses you would have gotten at the store. 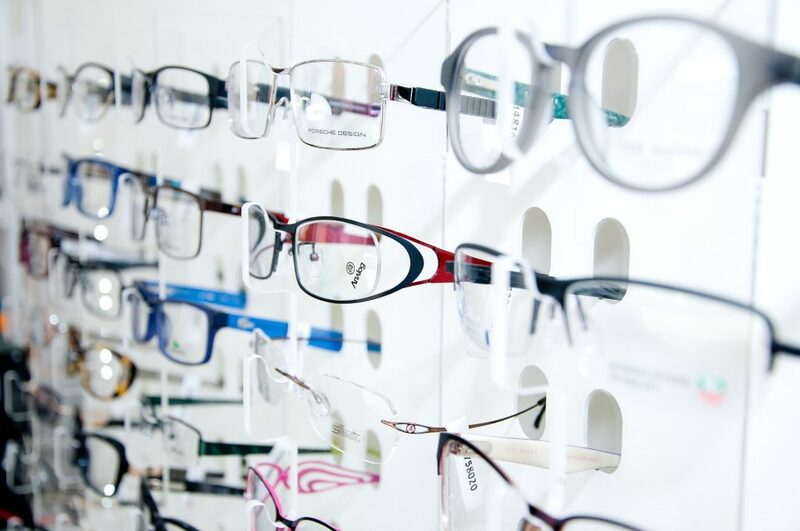 Some people argue that you should buy from a local store so that you can go back for adjustments if there are problems with the fit or prescription or that brand name frames are higher quality and last longer. If you’ve ever watched an optician at the store do minor adjustments for you, it basically involves bending the nose pieces or earpieces so the eyeglasses sit on your head better. If you found your online purchased glasses don’t fit perfectly, you might be able to adjust your glasses at home yourself. Worst-case scenario, you can take them to an optician and pay them to do it for you and still come out ahead. If you are worried about problems with the prescription, you can take them to a local optometrist also and pay to have the prescription of the glasses checked. Many online retailers have a 30 day return policy and will remake the glasses for you if there are manufacturing errors. As for brand name frames being better or lasting longer, remember how most eyewear is made by Luxottica anyways? Rather than spend close to $500 out-the-door at the store for one pair, I purchased three pairs of glasses from Zenni Optical for a fraction of the cost. In fact, I actually combined my order with my brother since the shipping was the same, and we ended up with five pairs for less than $75 shipped! My $6.95 pair of glasses from online lasted about 2 years and finally broke at the hinge after I rolled on top of them in bed one too many times. I don’t even worry about losing or breaking my glasses anymore since I have extras available. Have you bought eyeglasses online before? What is your experience shopping for glasses on the internet? Which site did you by from? Did you encounter any problems or do you have any useful tips?